College sports: It’s time to evict big-time sports from American higher education. It’s time to evict big-time sports from American higher education. James Madison University, my current employer, recently commissioned an “overall strategic plan” for its athletics program. Revealed to the public in an admirable gesture of institutional transparency, the plan claims that JMU is “well-positioned” for a transition to the highest level of college sports, the Football Bowl Subdivision. Though administrators are open to the idea of moving on up, the James Madison faculty, myself included, is substantially less enthused. Why do the vast majority of us oppose the move? First, we worry about the numbers. There is no question that FBS programs are risky investments and that they’re correlated with disproportionately high levels of institutional athletics funding. (Statements to the contrary may reflect a conflict of interest, like when the company that produced your feasibility study is also retained to recruit your new head coach.) There’s also widespread concern about endorsing a financial scheme dependent on unpaid labor for its solvency, labor that may one day be declared illegal. And yes, longtime professors who saw their salaries frozen for five years are viscerally upset by a plan that suggests hiking student fees to fund a major investment in our football program. Yet the financial cost of college football is nothing compared with its cost to our integrity. Are some people such addicts that they will continue to rationalize the exploitation of workers on whose battered bodies their beloved entertainment industry is built? Does the rush of a win for the home team allow them to forget those teenagers who gamble on unlikely stardom and lose? Are they willing to stomach endemic sexism and the scourge of campus sexual assault? So be it. But I will not stand by as the engineers and patrons of this system pervert my religion and desecrate its churches. But these cathedrals should not be the crown jewels of college campuses, and athletes should not be our evangelists. It’s true that academia and sports complement each other—Plato himself was an excellent wrestler, and Confucian students were expected to master archery and charioteering alongside writing and arithmetic. 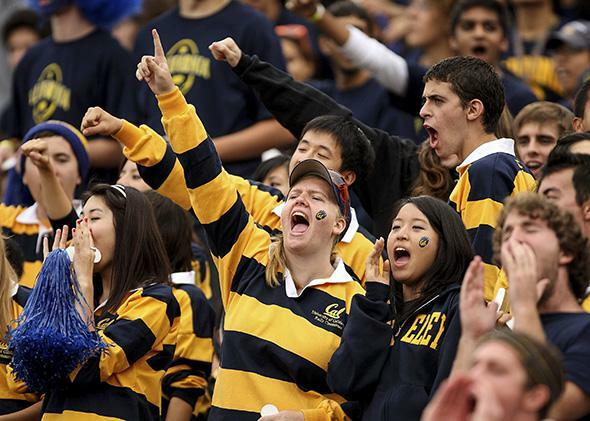 Yet Plato and Confucius would surely be appalled, as we should be, to hear that University of California–Berkeley pays its Nobel laureate in physics one-tenth the salary of its football coach, or that some institutional athletics subsidies can reach 1.5 times the total library budget. The dubious profitability of athletics is beside the point: These figures represent and legitimize a profound disorder of values. But what if 10 years from now the Vatican’s star cricketers are better known than saints, and more people recognize the coach’s name than the Pope’s? What if parishioners actually gave alms in proportion to the team’s success? What if the St. Peter’s Cricket Club stadium dwarfed St. Peter’s Basilica? Catholicism, like our education system, would look like an unholy charade, its former worshippers slowly lost to services at the new cathedral of civic religion. In the case of football stadiums, coliseum might be a better metaphor than cathedral. 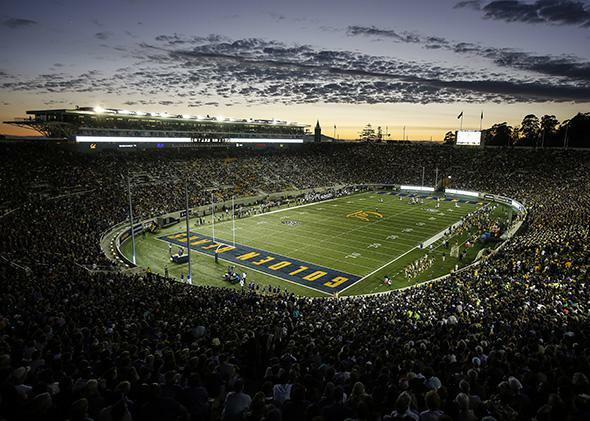 (UC–Berkeley’s football stadium was actually modeled after the Roman Colosseum.) The Roman republic’s gladiatorial matches were enormously popular, providing sponsors with publicity while satisfying the masses’ desire for cheap entertainment. When the moral depravity of the games became undeniable, imperial edicts were passed to restrict them, but they were largely ineffective. The people could not go without their blood sport, and even Emperor Constantine turned a blind eye to his own laws. Fans crowd the stands at UC–Berkeley’s California Memorial Stadium to watch the California Golden Bears play the Northwestern Wildcats on Aug. 31, 2013. At Boston University, which dropped its football program in 1997, the number of alumni donors is up this year, despite a nationwide downward trend in annual giving. Intramural sports participation has risen 55 percent. And then there’s Spelman, and Hofstra, and UC–Santa Barbara, and, well, the list goes on. As I contemplate the recently renovated $62 million stadium on my own campus (naming rights still available! ), it strikes me that a traditional religion once compromised its morals to pay for fancy cathedrals. Originally a minor aspect of Catholicism, indulgences took off when they were monetized effectively. Despite limits placed by the Fourth Lateran Council in 1215, churches continued to bleed funds from the faithful in exchange for promises of salvation. The issue came to a head in 1517 when Pope Leo X sold indulgences to finance renovations of St. Peter’s Basilica. Scandalized, Martin Luther nailed his 95 Theses to the door of All Saints’ Church in Wittenberg and started the Protestant Reformation. It is time for our own reformation. Students and parents: Choose schools based on the educational experiences they offer, not the ranking of their teams. Alumni: Donate because your school taught you something, not because it wins games. Faculty, administrators, and presidents: Don’t let your fear of being martyred stop you from speaking out publicly against big-money college sports. If higher education in America wants to preserve its integrity, we have no choice but to demand together: Get your stadiums out of our churches.